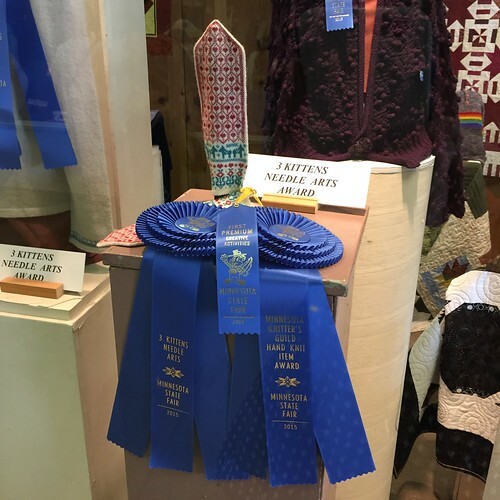 First, for those of you who don’t follow us on Facebook or Instagram, my Hearts and Dalas Mittens took home their share of ribbons. 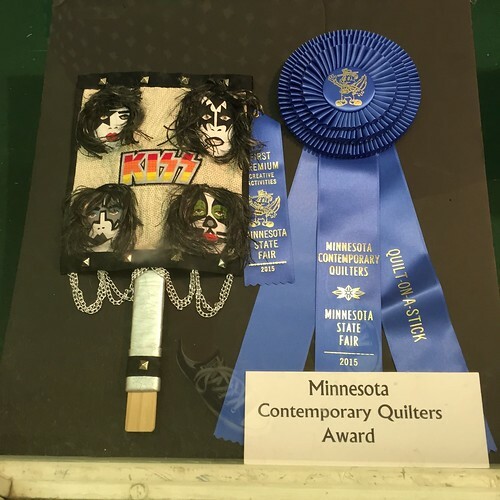 I won First Premium in Mittens, Color Pattern, the 3 Kittens NeedleArts Award for Best Use of Color and Texture in Mittens and the Minnesota Knitters Guild Award for Best Mittens. Talk about a thrill! 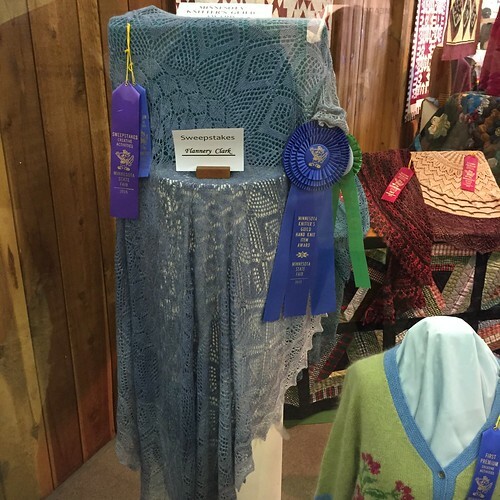 I did not win the Sweepstakes for Best Knit Item in the fair, this beautiful shawl by Flanknits took that honor. I was blown away by this amazing sweater by Twinsetellen, such gorgeous fine work! People looking at it around me insisted there was no way it was hand knit! 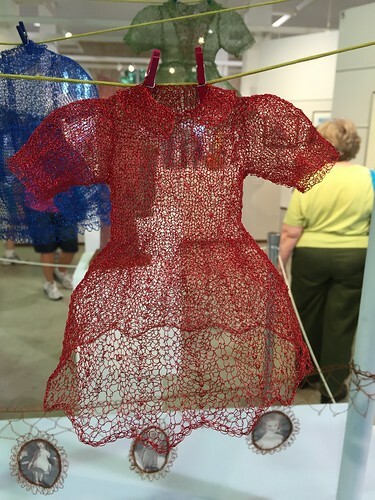 She also won for this incredibly detailed baby sweater. Here’s some of the winners in socks and hats. 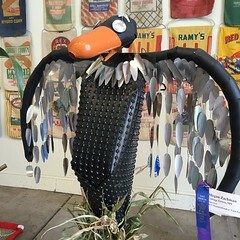 There seemed to be so many entries this year they had a hard time displaying them all. 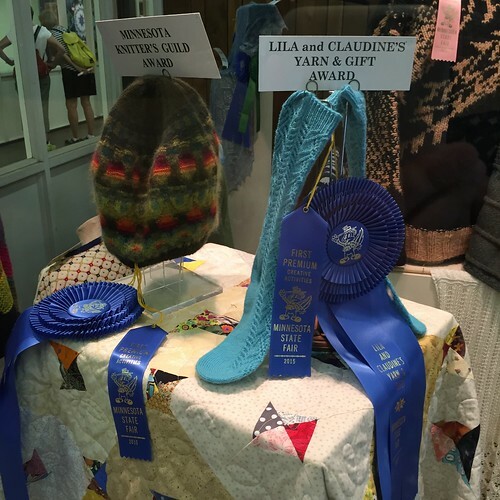 In the lightweight shawl category there were forty-two entries and in my color work mitten category there were twenty-five! I had to pull myself away from the knitting because there were so many other things to look at. 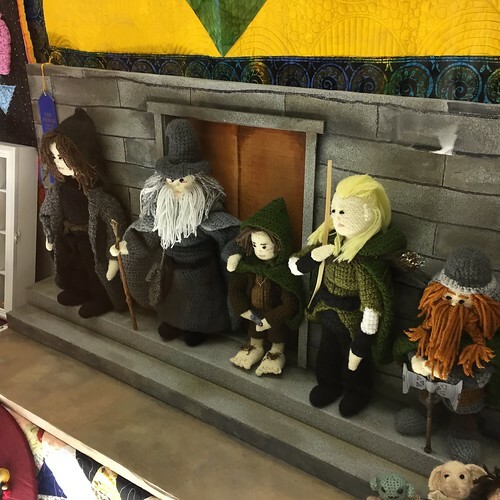 In crochet there was this amazing set of Lord of the Rings characters. 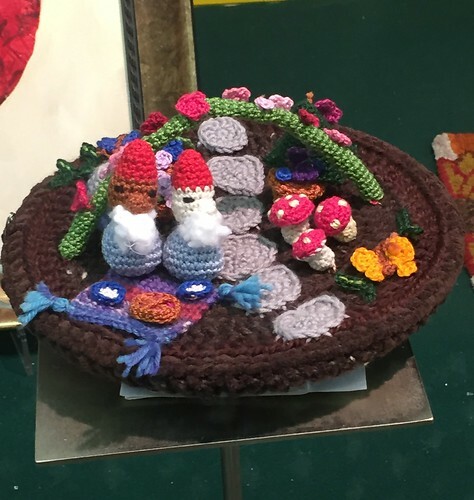 This garden made me think I should enter my knit fantasy garden next year. 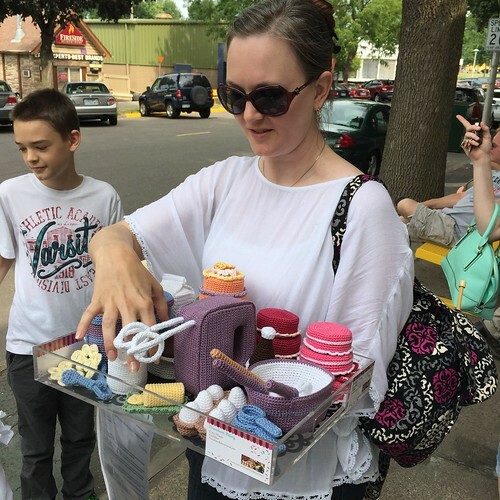 This cute crocheted baking set by Threadbare Bakery that was in line behind me on entry drop-off day, took home three ribbons. I absolutely loved these little animal dolls. I can’t believe they only took second place. 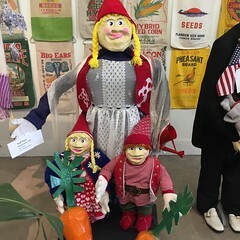 They really show me I need to up my game if I want to enter my elf dolls next year. 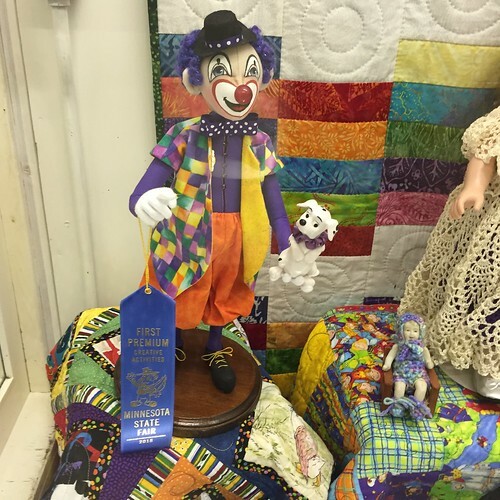 This was first place in the doll category. Lots of work, though I find clowns a bit scary sometimes. On to quilts. This one just blew me away! The quilting was actually “simple,” just little squares, but oh-so-precise. Then look at that embroidery! It has the crisp, modern look I love. And how fun is this quilt?! 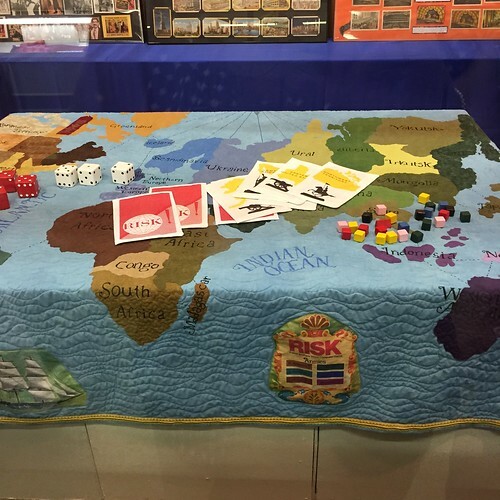 A giant game of Risk. 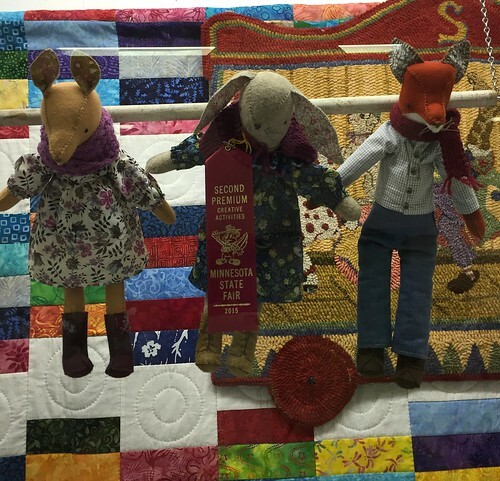 The theme for this year’s Quilt on a Stick was Grandstand performers. The winner paid homage to Kiss. Love the chains and hair. The entries in this category are always fun. 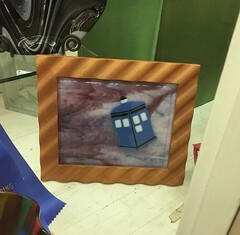 Doctor Who was a popular theme, here in glass art and seed art. I’m always so impressed by the projects by school age kids in the Education and 4-H buildings, some of them put the adult entries to shame. 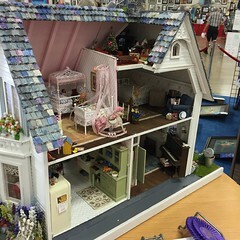 This ornate, detailed dollhouse was made by and 8th grader. 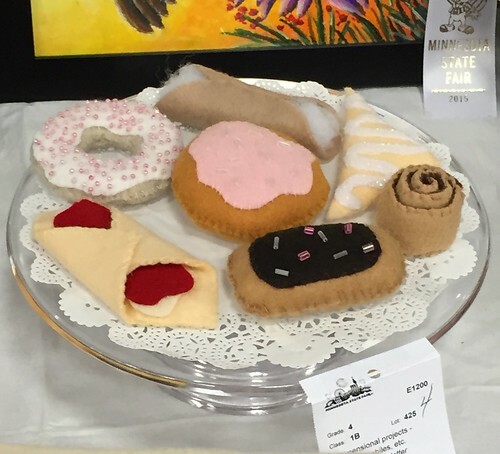 How about this felt food sewn up by a 4th grader?! 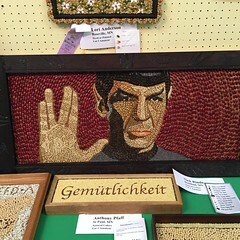 Over in the Agricultural Building, people got really creative with their seed art and scarecrows. It’s a nice call-back to the origins of the Fair. 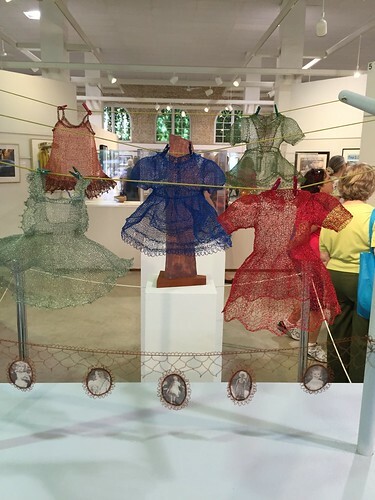 Finally, over in Fine Arts, there was this amazing sculpture of dresses knit from wire. Look at the detail on this right down to a little collar! 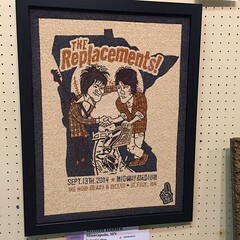 Every year I’m so impressed by the skill and creativity of my fellow Minnesotans. It’s also got me thinking about my entries for next year! 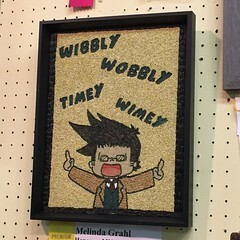 4 years ago by Kat in Crafts , Crochet , Embroidery , Knitting , Places We Go , Quilting , Sewing | You can follow any responses to this entry through the RSS feed. You can leave a response, or trackback from your own site. Congrats on your ribbons/awards. I had a good feeling about this year and so glad you got the recognition you so rightly deserve. Thanks so much. It was fun to go pick up those ribbons yesterday. Wow! And I thought competition at our county fair was tough!! Beautiful entries and so many!! Do you find awards are based more on merit or whim of judges? We had an issue with that here . . 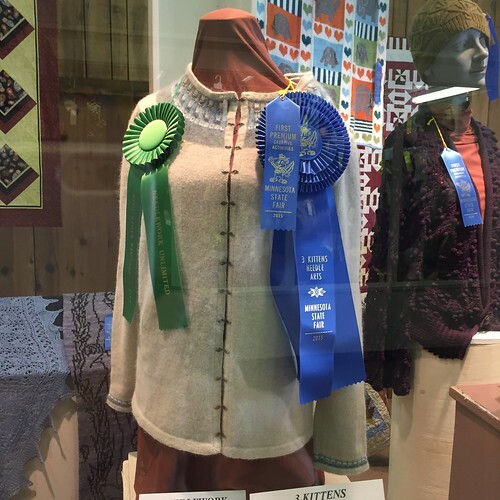 I think the things that won, at least in the knitting category which is what I know best, deserved to win. That said, I do think the judges have a preference for certain things. I went back and looked a past years’ winners and found they were mostly the same shape, with the same type of thumb and Scandinavian in design. I kept all that in mind when I was designing mine. Let’s face it judges are human and even if they try to be completely unbiased, some personal taste will come into their decisions. You rock the ribbons! Congrats!!! Honestly though, I knew you were going to win. And you did it in such a spectacular way! I’m so proud to know you! Awesome job! I’m excited to see which category you decide to take on next year, now that you’ve achieved success with the mittens. 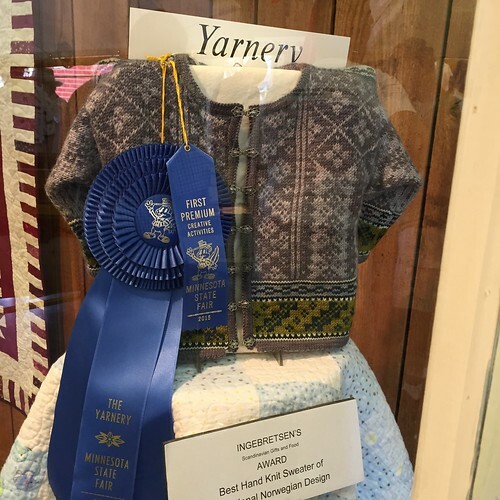 But I didn’t win the Sweepstakes for best knit item in the fair and I wonder if mittens are my best bet towards that goal. OMG! I saw your mitten and didn’t realize it was yours. 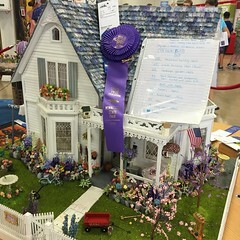 I told my husband how amazing it was and that it definitely deserved all those ribbons! Great work and congratulations! Thanks so much! I really worked for the ribbons this year. I am so proud of you. Congratulations! You deserved the ribbons for such a beautiful job. 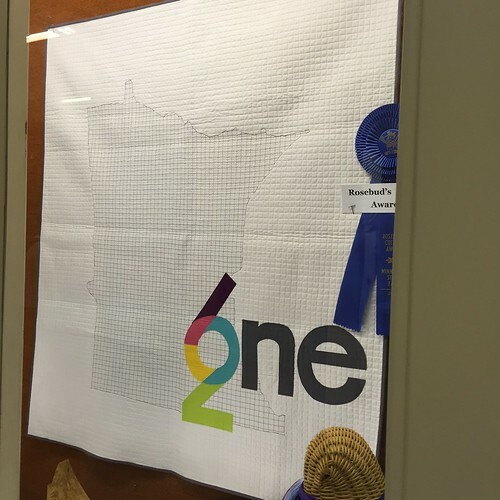 I knew you would win first place with your mittens with such artwork. They look beautiful. Thanks for posting all the pictures. Great to meet you last night, and see those amazing mittens up close! Now to figure out how to get a better display system! Seems like as the Knitter’s Guild we should have some pull! Nice to meet you in person last night too.